When I created this yoga mat tote I wanted something functional and will look stylish with my everyday lifestyle. 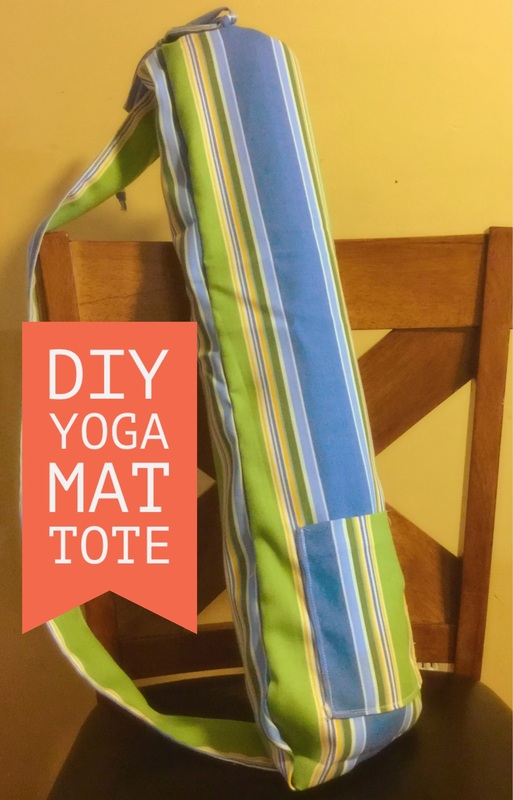 A yoga mat tote is a simple easy diy project that will take less than one day to make if you have a little experience with a sewing machine. If you are not very experience with a sewing machine take your time and have fun. 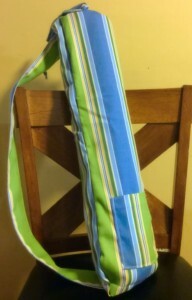 A yoga mat tote is a fun project you can create for transporting your yoga mat. You will need heavy weight (home decor) or canvas fabric when creating this project. Finished size is 8” wide x 30” tall. This tote was created for a thin yoga mat. Please measure with of yoga mat before creating this project. For thicker yoga mats double the width of the fabric measurement to insure your mat fits. Optional: 1 yard ¼ thick cord for bag drawstring. 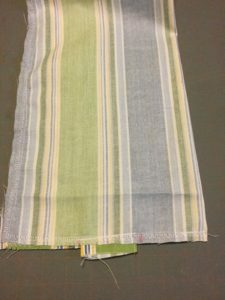 Preshrink Fabric: Wash and press fabric before beginning this project. 1. 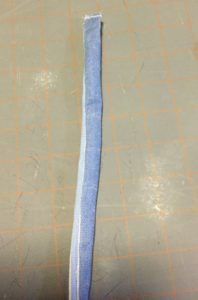 On the wrong side of the fabric measure and mark following the dimensions below. Then use your scissors to cut out the fabric following the marked lines. Body of the bag: Cut one 17” wide x 32” long piece. Strap: 5 ½ wide x 40 long. Pocket: 6” wide x 7 ½” long. 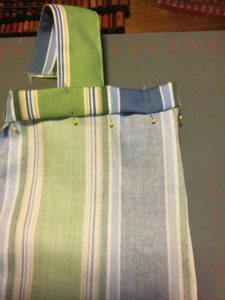 Click Here: Follow how to sew a tote bag pocket instructions. Pin the pocket to the bag piece 3″ up from the bottom and 2″ from the sides of the fabric making sure the pocket is properly placed. Topstitch down all 3 sides of the pocket making sure the backstitch on the top ends to reinforce the pocket. Fold strap in half along the 40” length of the fabric right sides together (right sides should be touching each other).Matching raw edges pin the fabric in place. 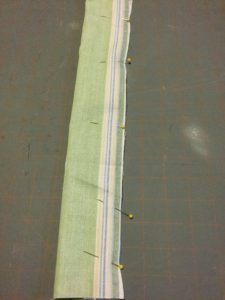 Using a ½” seam allowance stitch down the edge of the fabric backstitching at both ends. 1. Fold the bag lengthwise right sides together matching raw edges. Center one end of the strap at the bottom of fabric (make sure that at least ¼” of the strap extends beyond the bottom of the fabric to ensure attachment) pin fabric in place along bottom and length edge of fabric. Stitch ½” along bottom edge of fabric backstitching several times over strap then along length edge stopping 2 ½” at the top. Then stitching 1 ½” from the top down leaving an 1” opening in the bag. Press side seams open. 3. Bring the strap up along the side without the pocket. Fold the edge of the strap under ½” then press. 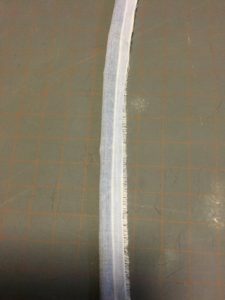 Making sure the strap is centered and lying flat to the bag on the side without the pocket, pin the strap at least ½” below the casing stitching line. Backstitch several times along the strap to make sure it is secured in place without stitching over the casing. 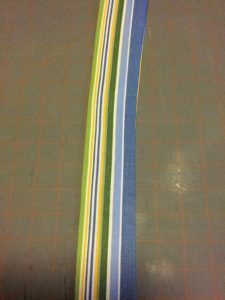 Fold the fabric right sides together lengthwise, pin and stitch ½” along edge of fabric. 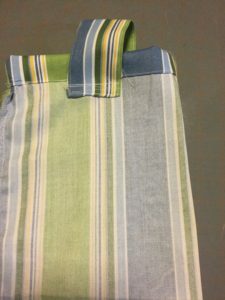 Turn fabric right sides out, turn in raw edges stitch. Now you have a drawstring for you tote bag. Using a safety pin, pull the cord through the casing.